Every day, through acts of kindness, professionalism and service, Upstate employees, students and volunteers live the values of Upstate Medical University. 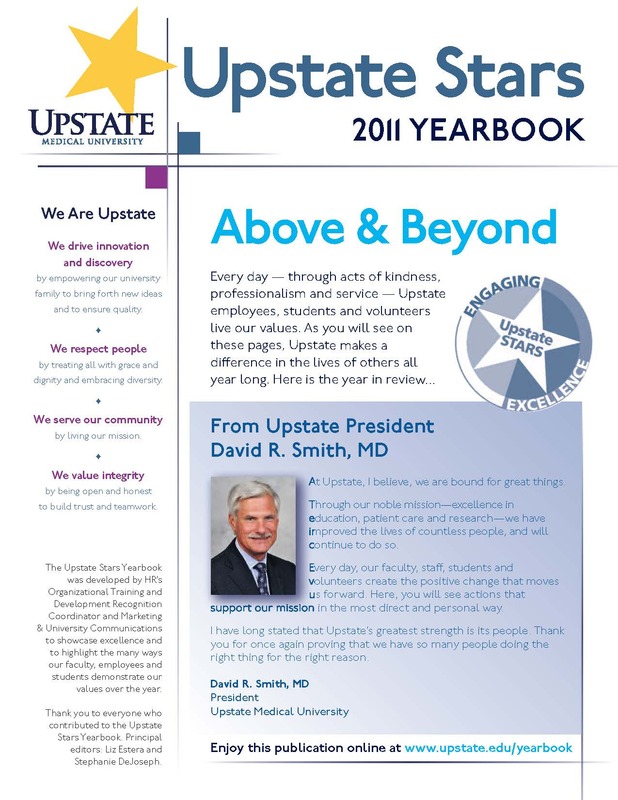 It’s time to glance back at 2011, at the Upstate Stars that make up our annual yearbook of employee achievement. See how many friends and co-workers you can find in these 44 pages, provided electronically in an effort to go green. This entry was posted in community and tagged academic medical center, health care blog, health care social media, hospital blog, hospital social media, medical blog, SUNY, syracuse health care, syracuse hospital, university hospital, upstate medical, upstate university. Bookmark the permalink.